Act in accordance with applicable laws and the organization’s governing documents, including the articles of incorporation, bylaws, policies, and plans to ensure the organization and staff are adhering to these requirements; protect the organization’s 501(c)(3) status. Work closely with the Executive Committee and Board of Directors to ensure successful fulfillment of the organization’s mission, helping to provide overall strategic guidance and leadership. Keep the board informed about the operations of the organization to facilitate fulfillment of its governance and fiduciary obligations. Oversee development and management of the annual budget in collaboration with the Director of Operations; periodically and as needed, provide information and report to the Board regarding the financial condition and operational activities of CFM. Ensure records, policies, procedures, and guidelines are in compliance with the constitution and by-laws, and revised/updated as necessary. Effectively represent and communicate the mission, goals, programs, and more to the Board, members, affiliate organizations, and the public. Analyze program operations and recommend methods, procedures, and policies to improve efficiency and effectiveness. Hire, manage, direct, mentor, and support professional staff and volunteers. Provide leadership and oversight to Resource Advisory Committees. Ensure the organization is on sound financial footing and has sufficient funding to support staff and programs in the short and long term. Actively plan and direct overall funds development and fundraising activities. Directly participate in fundraising activities/campaigns through various means(e.g., writing letters, speeches, face-to-face solicitations, special events, etc). Cultivate major donor prospects, including individuals, corporations, and foundations. Analyze overall effectiveness of fundraising activities, identify trends, and develop new strategies for future growth. Ensure development and implementation of a donor recognition program; ensure donor management processes are appropriately managed and up-to-date. Oversee development, implementation, and growth of an aggressive marketing initiative to increase and diversify individual and affiliate memberships. Ensure membership and donor management processes are appropriately managed and up- to-date. Promote CFM interests to the Governor, Legislature, and Executive Branch agencies. Monitor legislative activities and represent CFM interests during the legislative session and other times during the year. Serve as a liaison between CFM and state agencies. Effectively promote and represent CFM interests with the media, businesses, conservation and agricultural communities, and educational institutions. Serve as representative to the National Wildlife Federation(NWF). Serve as the primary spokesperson for CFM. 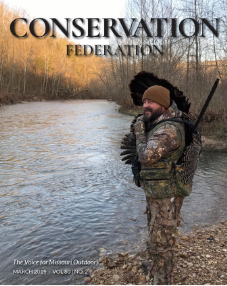 Oversee, direct, and contribute to all external communications efforts including the magazine and all online content (i.e., website, social media); also serve as editor of Conservation Federation the organizations’ bi-monthly publication. Handle public relations activities, client relations, and inter-organizational relations. Partner and collaborate with affiliate organizations on activities of mutual interest. Coordinate with staff in the creation and maintenance of partnerships with organizations and governmental entities to further CFM’s mission. Effectively establish and maintain relationships with internal and external constituencies including National Wildlife Federation, Missouri Department of Natural Resources, Missouri Department of Conservation, and other federal, state and local governments. A BS/BA degree in natural resources, public administration, non-profit administration, or closely related fields is preferred, with three to five years of experience as a proven leader in natural resource conservation and/or non-profit work. Ability to obtain a Missouri Driver’s license within 6 months. Official Domicile: Jefferson City or 30-mile radius. Advanced skills in leadership, management, communications, and funds development, with strong analytical, planning, and managerial skills. Highly motivated, self-directed, and capable of exercising sound, independent judgment working effectively with professional and support staff, the CFM membership, natural resource agencies, other conservation organizations, elected officials, and the media. Proven ability in leading people and working collaboratively with a diverse set of constituents and stakeholders (i.e., board members, donors, legislators, partners, volunteers) for the achievement of common goals. Ability to work under pressure, meet deadlines, and handle complex situations; strong organizational skills with ability to manage multiple priorities/activities, delegate effectively, and motivate others. Proven ability in fundraising and non-profit management, including identifying, developing and sustaining new sources of financial support, preparing budgets and financial reports and working with a board of directors. Strong public speaking and writing skills, and ability to effectively communicate with a wide range of audiences. Proficient with technology applications and basic office systems. Willingness to travel frequently to attend meetings/events, including evenings and weekends as necessary. Salary is commensurate with education and experience. Base Salary is $65,000. Benefits offered include health and life insurance plans, retirement package, and vacation leave.